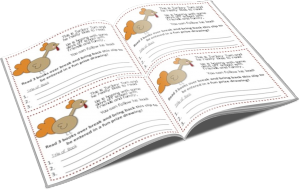 I know many of you do not like to assign a bunch of homework over the holiday break, but you do want your students to read of course, because reading is the key to everything. So I threw together this fun little freebie for you to pass out the last day before break. I have included a color copy and a grayscale version for those of you who don’t have access to a color copier and prefer instead to just copy on colored paper instead. Grab it at Organized Classroom now.